“This set of reusable grocery bags comes in a variety of cute patterns." If you’re looking for the best combination of value and usefulness in reusable grocery bags, our top choice is the BagPodz Reusable Bag and Storage System. This handy set of reusable grocery bags come stored in their own nylon pouch, complete with a carabiner clip to attach the pouch to your purse or shopping cart. This eliminates the hassle of collecting together crinkled reusable bags and trying to remember to stick a few in your already full purse or put them in the car. Simply grab the BagPodz system and you’re ready for an eco-friendly shopping trip. The reusable grocery bags themselves are made of strong ripstop nylon. The bags are rated to hold up to 50 pounds, and shoppers do find them to be extremely strong, even when filled with many items. However, a few people have said that they wish the bags were bigger. They are on the small side for a reusable grocery bag, but with a high weight capacity and 10 separate bags included with the pod, you’re still likely to be able to haul all of your groceries with this set of reusable grocery bags. Choose BagPodz reusable grocery bags for convenient storage and great value. To be green while saving green, opt for the budget-priced Easy Fold Reusable Grocery Bags. This 3-pack of nylon reusable grocery bags are an inexpensive set that will save you hassle and plastic at the store. Each bag folds into an integrated pouch, making them handy to keep with you. The bags are constructed from 100 percent ripstop nylon, which is a plus for its durability and ability to be machine-washed. However, these bags only have a 20-pound weight capacity, which is significantly less than many other reusable grocery bags on the market. Still, if you don’t plan on loading up each bag with too much weight, these basic reusable grocery bags may be the right choice for you. Reusable grocery bags may be subject to spills, so many people are looking a bag that is also machine washable. If this is your top priority, choose a nylon bag like the BeeGreen Set of 5 Reusable Grocery Bags. These reusable grocery bags are made from 210T ripstop polyester, which is more durable than the lighter weight 190T polyester. The bags are also easy to clean – simply thrown them into the washing machine to get rid of smells, stains, and other casualties of shopping. Then line dry the bags before storing them away for future use. If you follow the care instructions, these bags shouldn’t shrink or unravel in the washing machine. This set of bags doesn’t come with a convenient sack to store them all in, but each bag is equipped with its own pouch that is sewn into the top inside seam. Fold the bag into the pouch to create an easy-to-stash shape, ready for your next shopping adventure. When it’s time to clean up the BeeGreen bags, you can put these washable reusable grocery bags right into the washing machine for a quick, thorough cleaning! If you’re looking for a stylish way to tote around your reusable grocery bags, then this set from CarryWell is just right for the job. The CarryWell set of reusable grocery bags and organizer come in a variety of eye-catching prints and colors. The organizer tote features a cute pattern or theme, while the set of reusable grocery bags are in a coordinating color. 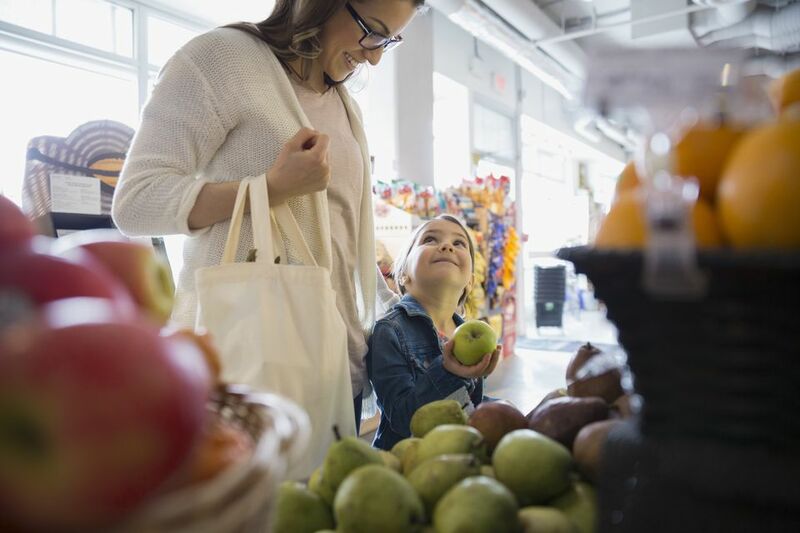 Put the cute tote over your shoulder and be prepared to get some compliments as you breeze through the checkout lines at the grocery store or your local farmer’s market. This CarryWell set includes 6 polypropylene grocery bags, an insulated bag for cold items, 2 produce bags and a carry tote. You don’t have to settle for generic reusable grocery bags with this set from CarryWell. Canvas is a popular choice for a reusable grocery bag, and the heavy duty waxed canvas grocery bag from Colony Co. is a popular, long-lasting choice. This reusable bag looks like a more stylish and durable version of the paper bag found in your grocery store’s checkout lane. Made from a specially-treated canvas also known as “duck canvas,” the material is water-resistant and stain-resistant. One thing to note is that this bag is not machine washable. However, its finish makes it easy to wipe clean. People praise this bag for its reinforced stitching and seams, and it’s often described as a bag that will last a lifetime. The bag stands up on its own, making it easy to load. It has the same dimensions as a brown paper grocery bag, but is much stronger. It is pricier than many other reusable grocery bags, but the durability and functionality outweigh the cost. If your grocery list includes items that need to be kept cold, you need an insulated reusable grocery bag for food safety. The Earthwise Large Insulated Grocery Bag is a practical choice. This set of 2 insulated grocery bags can keep frozen vegetables, juice, meats and more cool on the ride home from the store. Double-insulated walls and a zippered lid keep out warm air. A PEVA lining provides a waterproof barrier in the event of a spill inside the bag. Shoppers have found that these bags work great for short-term transit, and items are acceptably cold after arriving home. For longer trips, you may want to add an ice pack to keep the temperature inside the bag at a safe level. The Earthwise Insulated Grocery Bags are a great way to have peace of mind that your cold foods will stay cold. At the same time, the insulation can also keep hot foods warm, making these reusable grocery bags versatile. For a reusable grocery bag that folds flat when not in use, choose a collapsible version like the CleverMade SnapBasket. This collapsible reusable shopping tote is perfect for hauling all sorts of food-related items, thanks to its reinforced steel rim and rigid baseboard for stability. There’s plenty of room inside for canned goods, boxes of cereal or pasta and produce. The capacity of the interior is 17 gallons by volume, and its weight capacity is 55 pounds. Aside from the generous size of the SnapBasket, you’ll appreciate that the tote folds flat when not in use. This is a great feature if you store your reusable shopping bags in the car. A tote folded flat is out of the way, but ready for use in an instant.